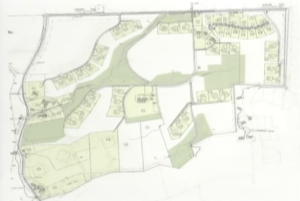 At the August 5, 2013 meeting of the Radnor Township Planning Commission (YouTube video), the public saw its first glimpse of a proposed development of the Ardrossan site. 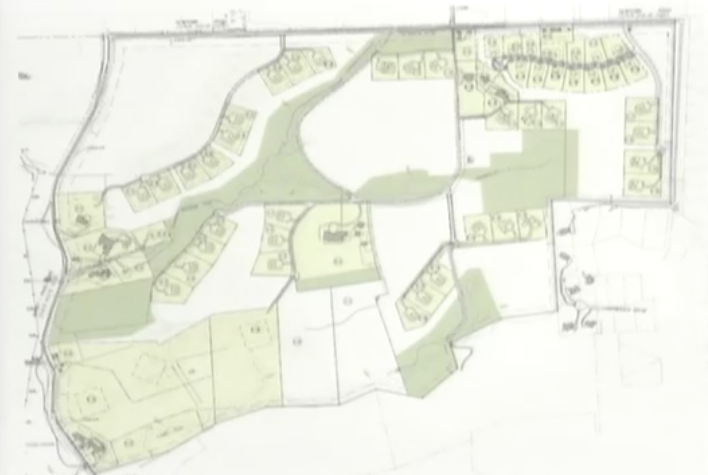 The proposal would have up to 76 new homes on the 311 acre site, with the remaining undeveloped space reserved either for open space or “investment property” that can be purchased by homeowners with the hopes that they keep these spaces open. A question was raised by a public commenter about the Radnor Historical Society’s 2011 Preservation Watch List, which listed the 1912 mansion and its acreage as the #1 threatened resource in Radnor. Though the division of the land is at this point an inevitability, it was made clear at the meeting that the Montgomery/Scott/Wheeler family manor home at the center of the property will remain, and will stay in the family. It also appeared on the plans presented at the meeting that most, if not all, of the many historic structures on the estate will remain, new development being built around them. In terms of existing and historic structures on Ardrossan, there is much more than the magnificent 1912 manor house designed by Horace Trumbauer. The Holly Tree House, for example, likely the oldest house in Radnor Township (dating from the early 18th century), a remarkable 19th century stone public schoolhouse, and a springhouse that marks the site of the birthplace of the mother of General Anthony Wayne. Despite the apparent intentions of the would-be developers of the site, it is important to realize that, given the current state of Radnor’s ordinances, no historic structures outside of Radnor’s three historic districts (North Wayne, South Wayne, Louella Court) are protected simply because they are historically significant. There are no ordinances to protect any building elsewhere in Radnor, even if, like the Holly Tree House, it is approaching its 300th birthday. The story would be different if, for example, Ardrossan were located in Lower Merion. In our neighboring township to the east, any property deemed eligible for listing on the National Register of Historic Places by the Pennsylvania Historical and Museum Commission is considered a “Class I” historic property (the entire Ardrossan estate, including all structures on the property, was deemed eligible for the National Register in 1997). Lower Merion’s Board of Commissioners has the ability to delay the demolition of a Class I resource by 90 days, and works with owners of such properties to find solutions where possible. The Lower Merion system is not perfect, as evidenced by the La Ronda escapade of 2009, but it is an official acknowledgement by the township that their local historic resources are worth preserving, and that such preservation is beneficial to the entire community. Once the development shown to the Planning Commission on August 5 begins, Ardrossan will never be the same. Yet it seems there is a concerted effort to keep many historic features intact. It is remarkable that such a large expanse of open space has remained unbuilt as long as it has; it will be the hope of many that those who purchase the investment parcels do so to keep them open, and that they will enact conservation easements to ensure that they remain open space in perpetuity.